Nicole's Needlework: Emma Mills Finished! The Scarlett House "Emma Mills 1839"
I made one change in the threads - I used GAST Mountain Mist instead of CC St. Bernard. My St. Bernard was very close to my GAST Dried Thyme, so I thought I'd use something a little lighter. I had so much fun stitching this sweet little sampler. Such a sweet little sampler! Love it! I have just discovered The Scarlett House and just bought 2 of their graphs. I can't wait to start them! I love this one that you have done. Congratulations on the finish, it's gorgeous! Lovely finish and it seems to have been a quick stitch. What a beautiful finish, Nicole! so pretty! I the scissors look great in the shot, too. It's so pretty, and so sweet! Love it! Emma is such a sweet sampler. Congrats on your finish. Ohh, wow!! Another lovely sampler!! Wonderful finish! Love the sweet, soft colors of this piece. Wonderful finish Nicole. You got through that so quick!! Very nice! That was sure quick. It is a sweet little sampler. You did a great job. Emma is beautiful! I just love it. Ooooo. Love this! Very nice! Congrats on the finish! Yet another fine finish Nicole! Congrats! Another lovely finish Nicole and in only ten days - you are amazing. She's gorgeous, Nicole. And boy, do you stitch fast! Beautiful!! I love this one, she's so sweet. She is such a sweet sampler. Congrats! What a lovely finish! I can see this one will be going on my 'must add to my stash sometime' list! Nicole a beautiful finish, your stitching is just lovely. Congratulations on your finish, Nicole! It is a very sweet sampler. It's one of those that you can hang anywhere and it will look just right! Oh, Nicole..what a beautiful little sampler!!! Love the colors and may have to think about that one. Very nicely done! What are your plans for her? Just stopping by to say how much I love your finish. Beautiful Finish Nicole!! Love the colours in this design!! Did you see I have a pattern called Sew Nicole? 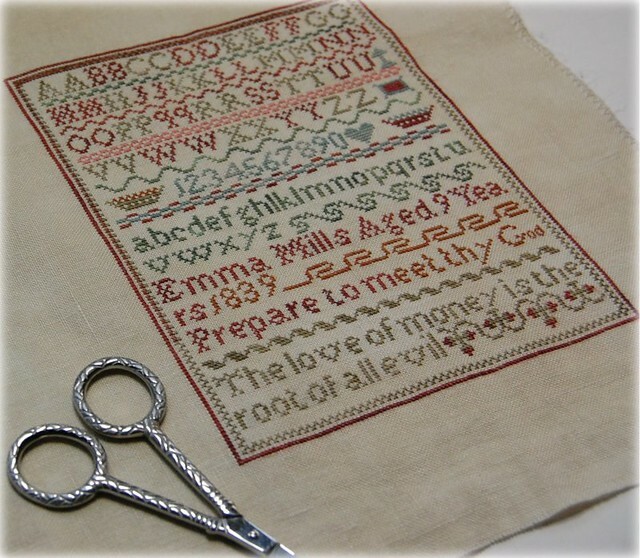 Congratulations, what a beautiful sampler! I haven't seen this one before, but i really love the colours in it.